The Sony E 18-135mm f3.5-5.6 OSS is a compact, lightweight and versatile general-purpose zoom for its cropped-frame mirrorless bodies, including the A6000, A5000 and NEX series. 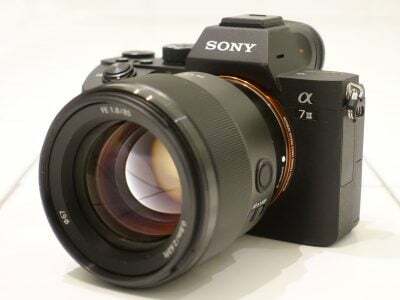 The 7.5x range takes you from wide-angle to respectable telephoto and while the focal ratio of f3.5-5.6 isn't anything unusual, it does allow some shallow depth-of-field effects at the long-end, especially at closer distances. And thankfully after a string of disappointing general-purpose zooms for their cropped-frame bodies, the E 18-135mm delivers crisp results across the frame and throughout the range. For the money the E 18-135mm is a no-brainer for all A6000, A5000 and NEX owners looking for a general-purpose zoom or an upgrade from the 16-50mm. Check prices on the Sony E 18-135mm f3.5-5.6 at Amazon, B&H, Adorama, or Wex. Alternatively get yourself a copy of my In Camera book or treat me to a coffee! Thanks! The Sony E 18-135mm f3.5-5.6 OSS is a general-purpose 7.5x zoom lens designed for Sony’s cropped-frame / APSC mirrorless cameras, including the A6000, A5000 and original NEX series, on which it delivers an equivalent range of 27-203mm. This represents a step-up in reach over the existing 18-105mm, 16-70mm and especially the 16-50mm kit zoom, without the size and weight of the earlier 18-200mm models. Measuring 67mm in diameter, 88mm in length and weighing 325g / 11.5oz, the E 18-135mm is fairly compact and lightweight, especially compared to rival lenses of the same specification from Canon, Nikon and Fujifilm. It’s an ideal match for the compact A6000 series bodies and I’d expect it to become a future kit zoom. The optical construction employs 16 elements in 12 groups, with a maximum focal ratio of f3.5-5.6, seven circular aperture blades, and a minimum focusing distance of 45cm. The filter diameter is 55mm, again smaller than rivals, and the lens is supplied with a bayonet hood. The E 18-135mm also features optical stabilisation that can work alongside the built-in stabilisation of models like the A6500, while the linear motor allows fast, smooth and quiet focusing for stills and movies. Find out if the E 18-135mm is the best general-purpose zoom for your Sony mirrorless camera in my review! Note some of the images in this article were taken during a Sony hosted event. Above: The E 18-135mm is a compact and lightweight lens, built mostly from engineering plastic. The zoom and focusing rings are fairly smooth and avoid the scratchy or loose feel of some lower priced lenses; it’s certainly a big step-up from the E 16-50mm collapsing kit zoom bundled with many of Sony’s APSC bodies. The overall look and feel is similar to the FE 24-105mm f3.5-5.6 launched a little earlier for Sony’s full-frame bodies, albeit less substantial and sadly lacking weather-sealing in order to meet the target weight, size and price point. Above: Here I’ve pictured the Sony E 18-135mm on the left, alongside the Canon EF-S 18-135mm USM (middle) and Nikon DX 18-140mm (right). All share essentially the same ranges, the same f3.5-5.6 focal ratios, and are also all designed for APSC sensor bodies. The size difference is however clear with the Sony lens being substantially smaller and lighter. Above: here I have the E 18-135mm mounted on the A6500 mirrorless body. The barrel diameter matches the base of the camera, so the combination sits on flat surfaces or on larger tripod plates without obstruction or wobbling. The lens is comfortably smaller than the earlier E 18-105mm f4G OSS and to me feels like a much better match on the A6000 bodies. I’d expect it to become bundled in the future as a kit zoom. Above: Mounted on an APSC body, the E 18-135mm delivers an equivalent range of 27-203mm. I’ve pictured the extremes on the range above when fitted to an A6500. The 7.5x range takes you from wide angle to mid-telephoto and enjoys greater reach than the 18-105mm, 16-70mm or 16-50mm zooms, albeit missing out on the slightly wider coverage of the last two. That said, both the 16-50mm and 16-70mm performed disappointingly in my tests at 16mm, so I don’t miss that slightly wider end of their ranges too much here. Above: Download the original file (Registered members of Vimeo only). In the video above you can see the optical range when filming, again with the A6500. The zoom control is manual, so misses-out on the smooth motorized adjustments of the E 18-105mm, but again the newer lens is smaller, lighter and sports a longer range. Above: Download the original file (Registered members of Vimeo only). The E 18-135mm offers optical stabilisation that can also work in conjunction with body-based stabilisation to improve the effectiveness. In the video above, I handheld the lens on an A6500 body as I walked around a market. You can also see how the combination can smoothly refocus; admittedly the market was fairly noisy, but in quiet environments the E 18-135mm remains barely audible thanks to its linear focusing motor. Above: Here’s a shot taken with the E 18-135mm at 18mm with the aperture wide-open at f3.5. The overall sharpness of the image is very good for a kit zoom with the aperture open. Sure it’s not pin-sharp in the extreme corners at f3.5, but it’s a considerable improvement over the earlier Sony general-purpose zooms for APSC bodies, and additional gains can be enjoyed by stopping it down a little, with the sweet-spot around f5.6. I have detailed crops on the sharpness on my quality page. Above: Here’s the E 18-135mm at 135mm, with the aperture wide-open at f5.6. Like most zooms with longer ranges, there’s inevitably some reduction in contrast at the long-end (more so at closer focusing distances here), but the overall quality remains very respectable in this distant shot, and again with good detail into the corners. Once again for a more detailed report, check out my quality page. Above: Not me with a beard, but my good friend and fellow photographer Steve Huff. It’s always going to be a challenge to achieve significantly shallow depth-of-field effects with an f3.5-5.6 zoom, but step-back, zoom-into a longer focal length and you’ll enjoy some separation. I shot Steve here at 110mm f5.6 and there’s a little blurring in the background. If you want greater blurring, I’d recommend a much brighter prime lens, such as the 50mm f1.8. Above: Here’s another example of the lens at 135mm f5.6 at fairly close range. I focused on the banana in the middle, allowing the fruits on either side to become more progressively blurred. Again it’s not the shallowest depth-of-field, but enough for some separation. Above: I snapped this candid using the A6500 with its screen angled-up and the lens at 135mm f5.6. Like the previous examples, there’s a little blurring but if you want something more significant at these distances you’ll need a brighter prime lens. Above: If you can get really close to your subject, you can enjoy much shallower depth-of-field effects. This coffee equipment in a café is nicely isolated from the background at 135mm f5.6, although beware as you approach the minimum focusing distance, there can be some loss of overall crispness. I have a couple of versions where I was a little closer to the subject and they’re not as sharp as this one. Above: Here’s another example of the potential for blurring, again at 135mm f5.6 at near to the closest focusing distance. Note the bokeh blobs in the background – not huge, but still nicely rendered for a kit zoom. Above: At the other end of the scale, you can shoot close-up at 18mm f3.5 and enjoy crisp results with a little blurring behind them. The details on these fruits are very sharp. Above: Close-down the aperture on a lens and you can use diffraction to turn bright point sources of light into spiked shapes. Here I shot straight-into the setting Sun at 18mm f22. The seven aperture blades result in 14 diffraction spikes that are respectably crisp for a lens of this price and specification. The Sony E 18-135mm f3.5-5.6 OSS is a compact, lightweight and versatile general-purpose zoom for its cropped-frame mirrorless bodies, including the A6000, A5000 and NEX series. The 7.5x range takes you from wide-angle to respectable telephoto and while the focal ratio of f3.5-5.6 isn’t anything unusual, it does allow some nicely-rendered shallow depth-of-field effects at the long-end, especially at closer distances. At first glance the spec appears to be a me-too response to similar lenses on rival systems, but Sony’s version is noticeably smaller and lighter than those from Canon, Nikon and Fujifilm, while also boasting smoother and quieter focusing. After a string of disappointing general-purpose zooms for their cropped-frame bodies, the E 18-135mm thankfully delivers fairly crisp results across the frame and throughout the range. I still think there’s room for a higher-end model sacrificing reach for weather-sealing and a brighter focal ratio, perhaps a 16-50mm f2.8-4, but for the money the E 18-135mm is a no-brainer for all A6000, A5000 and NEX owners looking for a compact general-purpose zoom or an upgrade from the 16-50mm. It’s an easy lens to recommend and one I hope becomes Sony’s future kit zoom for APSC bodies.